Crystalline gold is really coarse gold in its most natural state before being exposed to the elements and eroded by the weather. This makes this form of gold highly valuable since placer gold, which is a more common form of the metal, has been weathered by glaciers, floods, rains and other erosive processes. In many cases placer gold is almost completely smooth and has very little character. Crystalline gold however is still in its raw, untouched form often with spiky or sharp edges as it has been protected by the rocks and quartz that have shielded it from the elements. The very shape of crystalline gold is becoming harder to find since most gold veins of any real size have already been discovered and mined. Additionally, much of the gold that is mined in this form is quite small, almost microscopic in nature. Because these specimens are so rare, they will sell for quite a large sum on the open market, particularly if they are of any real size. Knowledgeable gold collectors understand their rarity, which is why they are willing to pay such a premium price for it. For the independent gold seeker, finding crystalline gold is very rare indeed. For the prospector, it is always possible that you may find these types of nuggets, but finding them is more difficult than finding standard placer gold. If you are interested in prospecting for crystalline gold specimens, there are a few places that will be more productive than others. The most important thing to do if you want to find crystalline gold is to research areas that are known to produce coarse gold specimens. Even in well-known gold districts, not all areas produce crystalline specimens. Search near areas that specimens have been found in the past. Explore old lode mines and waste rock piles at prospects up away from the waterways. Crystalline gold has not been weathered by erosion, so it is unlikely to be found down in the creeks and rivers. Check the hard rock deposits up high in the hills. Search for exposed gold veins. Often times these gold outcrops have already been discovered and worked by miners, but occasionally a prospector can find an area that has not been discovered. 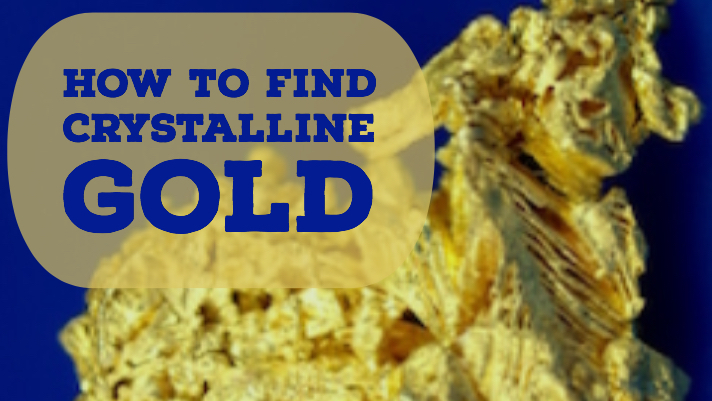 Patience is required if you are interested in searching for crystalline gold specimens. If you are in gold country, then it is relatively easy to find a bit of gold by panning in the creeks and rivers. If you decide to look for gold away from the known placer deposits, prepare yourself to go many days without finding anything. Patience is critical. A metal detector is probably your best tool for finding undiscovered crystalline gold deposits. Search in areas that are known to produce rare crystalline specimens, learn to use a quality gold detector , and have a lot of patience and you have a chance to find some quality gold.